This was originally posted on the LSE US Centre’s blog, LSEUSAPP, on August 6, 2016. Donald Trump’s campaign manager, Paul Manafort, has argued that Trump’s path to the Presidency was open because of his ability to win traditionally democratic Rust Belt states. Trump’s super PACs, however, are only targeting the Rust Belt states of Pennsylvania and Ohio, along with Florida. This is an extremely narrow map, but one that nonetheless has become something like the common sense of this election cycle. Trump, the argument goes, appeals to uneducated white workers more than any other group. To win, he needs to capture swing states with lots of disaffected white working-class voters. The Democrats are not particularly interested in fighting for these votes. Hillary Clinton’s acceptance speech at the Democratic convention, which seemed to have a word for each part of the Democratic coalition, could only appeal to white workers by mustering a comment on Trump’s hypocrisy (Trump ties are made in China, not Colorado! ), a ploy that worked with patrician Mitt Romney in 2012, but is unlikely to work with the new tribune of the white workers. Trump’s strategy is not terribly surprising. White workers have been slipping out of the New Deal coalition for decades now. The party has pursued policies that have exacerbated socio-economic inequality. Some Democratic politicians have been keenly aware that the party was losing white workers. Democratic Party politicians like Tom Harkin, John Edwards, and Bernie Sanders have tried to reorient the Democratic coalition to accommodate white workers, but all have failed. With white workers losing their attachment to the New Deal coalition, there have been several third party efforts to capture them: the Labor Party, the Alliance Party, and the Working Families Party have all attempted to occupy this ground; though only the Working Families Party survives. With Democrats ignoring them, and Trump uniquely able to tap into the grievances, authoritarianism, and racism of white workers, Trump might set a new Republican high-water mark for the percentage of Rust Belt white workers he manages to pull to his banner. Some have even discussed electoral realignment which situates Republicans as the party of the old economy and Democrats as the Party of the new one. Indeed, such a realignment, if the Republicans can add more Rust Belt states to their map, would certainly help stem the decline in the party’s ability to compete in national elections. White workers, and men in particular, are clearly available voters for Republicans and Trump. But the more interesting question is why white workers haven’t been solidly Republican for decades now. Since 1976, Democrats have mostly ignored labor issues, pursued a strong dollar, and abandoned protectionism. By 1996, free trade and financialization were Democratic Party orthodoxy. The transition to clean energy was added to the list in 2000. Democrats haven’t always ignored white workers. When Lyndon Johnson expanded the New Deal coalition to include African-Americans he attempted to transcend the racial divisions that inevitably fracture class coalitions in American politics. In 1964 it seemed possible that Johnson would succeed – he won in a landslide with 84 percent of union voters supporting him; but by 1968 his alliance was in ruins. Riots, busing, workplace integration, the end of residential segregation, and peace protests were all flashpoints that drove white workers first to a flirtation with the southern segregationist George Wallace, and then the Republican “law and order” candidate, Richard Nixon. Wallace won 10 percent or more of the vote in Indiana, Ohio, West Virginia, and Michigan in 1968. In an era when the white working class was a very large part of the Midwestern voting age population, the key factor keeping white workers attached to the Democratic coalition was labor unions. In the industrial Midwest CIO industrial unions had millions of members and, importantly, they tended to be far more integrationist than the building trades. Unions provided several functions in this regard. First, they provided people with everyday familiarity across the racial divide as well as the possibility of an ideological commitment to class solidarity. Unions develop members’ political skills and, as Jake Rosenfeld has shown, they facilitate the participation of the uneducated in the political process. 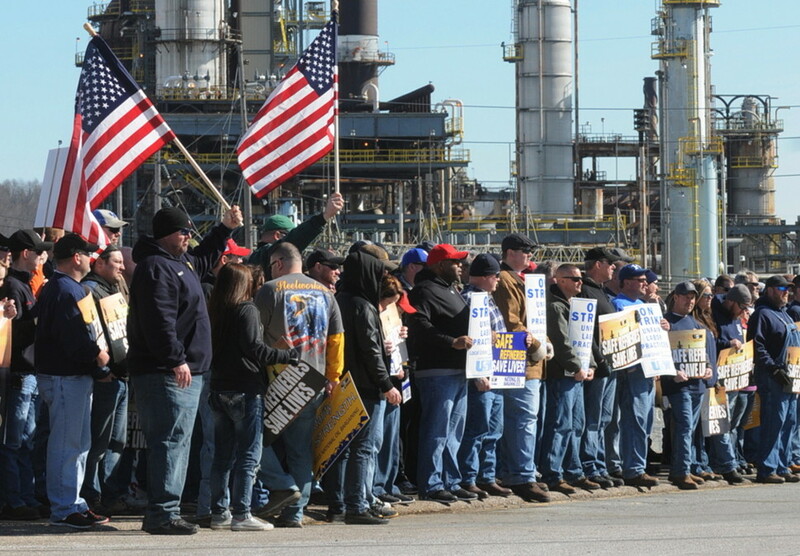 Unions raise money for candidates, though they can’t match corporate coffers. However, they are able to deploy members to organize, canvass, and turn people out on Election Day. Unions have often provided key support to Democratic candidates, much as evangelicals provide similar support to Republicans. The importance of unions has been seriously reduced, not just because union muscles have atrophied, but because candidates choose to use other mechanisms to secure victory. Bill Clinton was contemptuous of ground mobilizations and instead relied on corporate, as well as labor, contributions to maximize television exposure. Obama simply created his own organizing effort, which was probably the most sophisticated on-the-ground organizing effort ever deployed in a presidential election. Johnson’s unstable coalition did manage to capture 84 percent of the labor vote in 1964, but labor support for Democrats plummeted to 50 percent in 1968, according to National Election Survey data. Nixon and Wallace fractured labor unity, but while they exposed the racial fault line in the Democratic coalition, unions have provided a counterweight to the rightward drift of white workers. Union households have always delivered higher percentages of white Democratic voters than non-union households. Nonetheless, the effect has declined. As Figure 1 shows, the union vote for Obama only outperformed the non-union vote by about 8 percent, considerably lower than union support for any previous Democratic Party presidential candidate (using Roper data, 12-15 percent has been the norm for labor households’ outperformance of non-labor support for Democratic presidential candidates since 1976). Nonetheless, Nate Silver calculated that even that small 8 percent differential contributed about 1.7 percent to Obama’s vote total in 2008 (he won by 7.2 percent). While Democratic policies are certainly pushing white workers in smokestack industries out of the coalition, unions have also lost their ability to keep them anchored on the left. Labor’s share of the workforce has been gutted, and with new right to work laws in the heartland of industrial unionism, it is unlikely that the bleeding will be stanched. As Table 1 shows, in 1964, unionization rates were well over 30 percent in the Rust Belt; now it is around 10 percent. Even among labor’s remaining membership the percentage of white workers without a college degree has declined, and it was these members that were most significantly affected by unions. People of color and the educated are likely to vote Democrat regardless of union membership and it is this demographic that has a growing representation in labor as public-sector workers grow as a percentage of union membership. In general, the impact of unions on political outcomes is likely to be greatest where they are strongest, but that is in the solidly Democrat states of New York and California. The ability of unions to anchor the white working class in the Democratic coalition is practically gone. It is easy to see why white workers are more available to Trump than they were to Wallace and Nixon in 1968. Estimated state unionization rates come from Hirsch, MacPherson, and Vroman (2001). Note: Ohio passed a draconian right-to-work law in 2014, but it was decisively overturned by ballot initiative. We can see the extreme of this general dynamic in the case of West Virginia. The state is birthplace of the once mighty United Mineworkers, which was, along with the Southern Baptist Convention, a dominant force in the politics and community life of the state. The union’s membership was once over 800,000. Today it is between 50,000 and 60,000, with about 35,000 still in mining. West Virginia was resolutely loyal to the New Deal coalition from 1936 until 1996, outperforming the national Democratic vote by 4.5 percent over that period. However, union-busting, labor-saving technology, and organizational innovations like mountain-top removal not only ravaged union membership, but undermined the economic well-being of countless communities in the state. In 2000 the Democrats nominated climate-crusader Al Gore (who was also a free trade advocate) and West Virginia was lost to the Democrats, and has been ever since. With no unions to anchor West Virginia voters in the Democratic Party, there was a sudden and radical realignment of West Virginia voters, which is only getting more extreme in each successive election. Since 2000, West Virginia has underperformed the national Democratic vote by 8 percent, on average. Trump leads Clinton there by 23 percent. Of course, West Virginia is a very unusual state. It is overwhelmingly white and poor. It is also distinctively Baptist and uneducated. If Paul Manafort, Trump’s campaign manager, could construct an ideal voter for his candidate, it might look a lot like a West Virginia voter. Ohio and Pennsylvania, two of the states Trump’s campaign is targeting, both have a number of counties that share characteristics with West Virginia and a significant population of white workers who are no longer in unions. Does this mean that there is a Brexit-like revolt brewing in the Rust Belt? The “specter” of “right-wing populism” is certainly a scary force in Europe. Trump, the argument goes, is more of the same. He will mobilize those “left behind by globalization” to carry him to the White House in America’s own Brexit revolt. Trump is part of a global movement of the disaffected and, being on the side of history, will surprise us all on November 8. But will he? Unions, after all, are no longer particularly effective at holding the white working-class vote in the Democratic coalition. Judging by state politics in Michigan, Ohio, and Wisconsin, Rust Belt voters are perfectly happy giving power to Republicans who dismantle social services and pass right-to-work laws. But these states are no longer dominated by smokestack industries. Their populations have declined, raising the percentage of minority voters. Most have diversified their economies and now have educated workers in new economy industries. Ohio, which had more unemployment than the national average in the decade prior to the financial crisis, has had lower unemployment than the national average since. Cities are no longer composed of working-class communities surrounding factories. Instead, they are being reoccupied by young professionals. Latino migration is slow, but it is there. 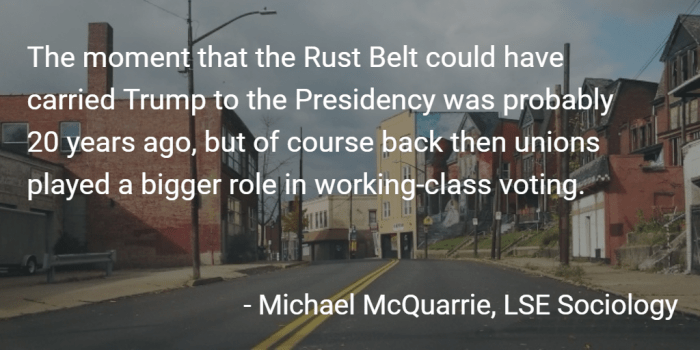 The moment that the Rust Belt could have carried Trump to the Presidency was probably 20 years ago, but of course back then unions played a bigger role in working-class voting. The number of uneducated white workers is shrinking, and without unions they are less likely to vote. Ohio has underperformed the national Democratic vote in several recent elections, so if the race is close Trump is likely to win it. But with Democrats extending their map in Virginia, Nevada, and North Carolina, Ohio is no longer enough to win. Pennsylvania, much less Wisconsin and Michigan, are probably out of reach. For him to win there he needs to mobilize whites generally, not just working-class and uneducated whites, but so far his campaign has been one of zero-sum game tradeoffs. A Trump victory would probably require a string of terrorist attacks, police assassinations, or Black Lives Matter protests—the conditions that gave Trump a bump in early July. Of course that is possible, but it is more likely that white support for Trump is not a battle cry of white working-class culture, but a death rattle.